This simple tool was designed for use with Paper Piecing; it is equally useful for a number of other pressing needs in the sewing room. It will quickly become indispensable for you when you do your piecing and sewing. Keep it next to your sewing machine; you will reach for it many times as you work. The PPP is made from various hardwoods (Red Oak, Pennsylvania Black Cherry or Black Walnut). It is approximately 6 inches long. 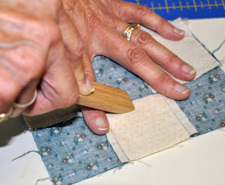 The tool is smooth and the tip beveled to allow you to easily move it over your fabric.